After nearly a year’s worth of negotiation sessions, and with little more than three hours remaining before the deadline, Major League Baseball’s owners and players came to terms on a new collective bargaining agreement Wednesday evening. Not only does this agreement avert a possible work stoppage, but it also means that teams will head into next week’s Winter Meetings with a better sense of the economic ground rules under which they’ll be operating in the coming seasons. It will be at least a few weeks, if not a couple months, before the final written version of the new CBA is released publicly. Indeed, while the owners and players reached a consensus on the core components of the deal last night, many of those verbal agreements must still be reduced to writing, a process that will take some time. To begin, the new agreement will last for five years, covering the 2017-2021 seasons. This means that by the time the next CBA expires, MLB will have enjoyed an unprecedented 26 years of uninterrupted labor peace. Considering the state of the sport’s labor relations following the 1994-95 players’ strike, that is quite an impressive accomplishment for the game. The new CBA’s modifications to the luxury-tax system may represent the most significant victory for the owners in the new agreement. As Ken Rosenthal reported last night, the luxury-tax threshold will rise from the existing $189 million to $195 million in 2017. From there, the threshold will go up to $197 million, $206 million, $209 million, and $210 million, respectively, over the final four years of the CBA. In addition, the penalties that clubs will pay for exceeding the luxury-tax threshold will also be adjusted in the new agreement. While teams modestly eclipsing the threshold will reportedly continue to incur penalties roughly approximate to those under the previous agreement — with fines ranging from 17.5% to 50.0% depending on how many years in a row the club has exceeded the threshold — any franchise that exceeds the limit by $20 million or more will now be subjected to an additional, supplemental tax of an extra 12%. Meanwhile, those franchises exceeding the limit by $40 million or more will potentially be subject to an even larger surcharge, resulting in a total tax of upwards of 90%. While the modest increases to the luxury-tax threshold will provide some incremental benefit to the players, it’s hard to see these changes as anything but a win for the owners. 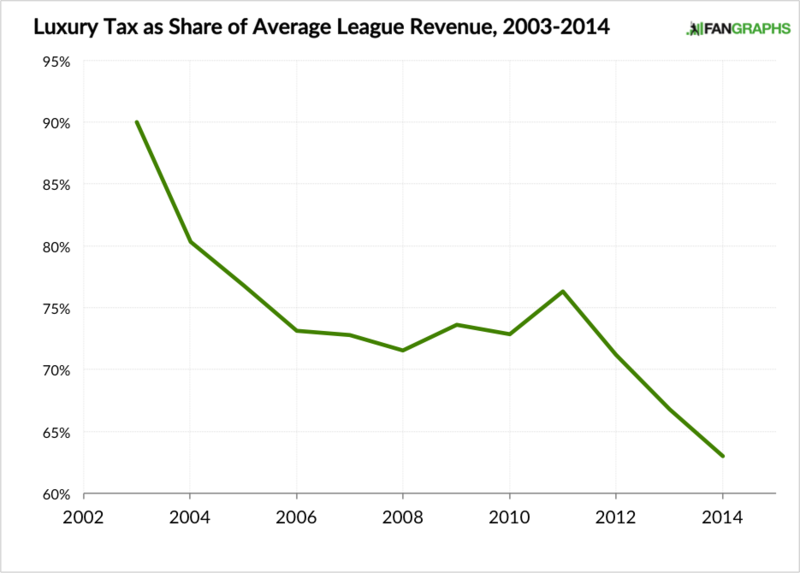 As I discussed last year, the luxury tax is a major factor in the precipitous decline of the players’ share of total league revenues over the last 10-15 years. In particular, whereas the luxury-tax threshold was originally set at a level approximating roughly 90% of the average MLB team’s share of overall league revenues back in 2003, in recent years it has dropped to a level representing less than 65% of the average team’s revenue share. As a result, the luxury tax now operates in many respects as a de facto salary cap for most teams, even those in the largest markets that have traditionally been the primary drivers of payroll growth in the sport. Based on the terms of the deal reported last night, the new CBA will do little to reverse these trends. Although the luxury-tax threshold will increase by a modest $6 million in 2017 under the new agreement, that new limit will represent only approximately 58% percent of the average team’s share of MLB’s $10 billion in estimated annual revenue. Thus, it appears that the new CBA will continue to exacerbate what was already a worrisome trend for the players, and can be expected to continue to significantly restrict the spending of the sport’s largest market teams. The players did secure a modest victory by persuading the owners to agree to a substantial modification of the qualifying-offer system for free agents beginning in the 2017-18 offseason. (The existing system will remain in place for the current offseason.) Specifically, beginning next winter, if a team extends to a player a qualifying offer, only to see him sign with another club, then the former team will receive a compensatory draft pick only if the player then signs a contract valued at $50 million or more. The specific pick received by the former team will reportedly depend on the size of the market in which it plays. Meanwhile, also beginning next year, any team signing a free agent who received a qualifying offer will no longer be at risk of losing their first-round draft pick. Instead, under the terms of the new deal, teams whose payrolls are in excess of the luxury-tax threshold will be required to forfeit a second- and fifth-round draft pick, along with $1 million of their international-signing-bonus allotment (as discussed further below); teams under the luxury-tax threshold will be docked a third-round pick. The rest of the qualifying offer system will reportedly remain unchanged, with Ken Rosenthal reporting that players must still remain on their former team’s roster for the entire season in order for the club to receive a compensatory draft pick. Similarly, the dollar value for the qualifying offer will continue to be determined based on the average of the salaries of the game’s top 125 players. Players potentially stand to benefit from these changes in two ways, with the new system both reducing the benefit of extending a qualifying offer for a player’s former team, while also reducing the penalty a team will face for signing such a player. First, by limiting the circumstances under which a team will receive draft-pick compensation for losing a free agent — awarding extra picks only to teams who lose a free agent receiving a $50-plus million contract — the new CBA should reduce the number of qualifying offers extended during a given offseason. That having been said, the number of players who will benefit from this change is likely to be rather small. In most cases, if a player is worth a one-year, $17.2 million contract offer, he can probably be expected to receive three times that rate over the course of a multi-year deal on the open market. Still, under this new system, a few borderline qualifying-offer recipients like Brett Anderson or Colby Rasmus may have avoided being saddled with the weight of draft-pick compensation when going on the market. That having been said, the more significant benefit to players under the new system will likely come from the decreased penalties teams will face for signing free agents who received qualifying offers. The difference between giving up a first-round pick and a third-round pick (for teams not over the luxury-tax threshold) could prove quite significant in many cases, increasing both the number of teams interested in signing a particular player, as well as the size of their salary offers. Still, these changes represent a rather modest victory for the players. Ultimately, the number of free agents who were significantly affected by the prior qualifying-offer system was quite small, representing only a tiny fraction of the union’s overall membership. So while a few players will likely stand to make several million dollars more from these changes, they are unlikely to provide considerable value to most union members. Although the creation of an international draft had been expected to be one of the major sticking points of the CBA negotiations, the owners reportedly moved away from that demand earlier in the week after receiving considerable pushback from the union. Instead, the new CBA will reportedly focus on tweaking the existing international signing rules by creating firmer spending limits that teams will no longer be able to exceed. In particular, Jayson Stark has reported that, under the new agreement, each team will receive a bonus pool of around $5 million to spend on amateur international talent. From a bargaining perspective, this seems like a reasonable compromise on the issue. The players can hang their hat on the fact that they were able to avoid subjecting amateur international players to a draft; from the league’s perspective, meanwhile, the owners will have attained some additional level of cost certainty with respect to amateur talent acquisition. That having been said, whether these new changes are ultimately sufficient to fix what most observers agreed had become broken system will likely depend on how the new spending limits are implemented, and how strictly they are enforced. Although it looked earlier this week as if the new CBA would expand the size of each team’s active roster from 25 to 26 players, with some corresponding reductions to the size of the 40-man active rosters in September, the final agreement will reportedly maintain the pre-existing roster limits. As a result, those who were hoping that the new agreement would bring an end to the spectacle of expanded September rosters — resulting in as many as 58 players appearing in a single game — are likely to be disappointed. Finally, although there had been some speculation that the players would push to reduce the regular-season schedule from 162 to 154 games, there was no such change made in the new CBA. That having been said, the two sides did agree to bump the start of the regular season up by a few days beginning in 2018. By extending the regular season across 187 days, instead of the existing 183, the league will create additional off days, enabling players to receive a few extra days of rest throughout the season. This isn’t an insignificant benefit for the union. Meanwhile, although there had also been some speculation that the new deal would include some provisions ensuring that teams will play earlier in the day before heading out on a cross-country flight, it’s not yet clear to what extent those terms worked their way into the new CBA. There is obviously a lot that we still don’t know about the new agreement — including any potential increases to the minimum salary, for instance. But given what has been reported this far, the new CBA appears to largely preserve the status quo in the game. And that makes sense, given that both players and owners had generally been doing well under the existing system. That having been said, if one were forced to pick a winner based on what we know so far, it would probably have to be the owners. While both sides can point to important concessions they were able to secure from the other side, it certainly appears that the owners have come out of the negotiations in a more favorable position from a financial perspective. Although they were unable to secure an international draft, the agreement the owners reached on that point will nevertheless apparently provide the cost certainty they’d been hoping to achieve. Additionally, the luxury-tax changes also appear to be a big win for the owners. Meanwhile, although the players certainly made some gains (modification of the qualifying offer system, changes to the playing schedule), it’s not clear that these achievements will result in meaningful financial gains for most players. We hoped you liked reading Assessing What We Know About the New CBA by Nathaniel Grow! An important distinction to make is the added tax penalties are surtaxes (as reported), so it’s inaccurate to say a “total tax of upwards of 90%”. For a team to be assessed a total tax at that rate or higher, they would need to approach a $350mn payroll for three straight years.